Friends often ask me how I find the time to cook so much. While I get paid to do so at times, I also make it a priority in my non-work life. That is, when I can actually distinguish the two. Some people spend their evenings at the gym or the pub. I usually spend them in my kitchen. But here’s the thing – I probably cook way less than they imagine. When I cook, I almost always make meals that go further than just one occasion. I embrace leftovers and usually get at least a lunch or second dinner out of each meal. You might find me almost always enjoying a home cooked meal, but that doesn’t mean I cook up something new every single day. Soup is the perfect example of winter cooking that really stretches itself during the week. Even if it’s just me I’m cooking dinner for, I’ll make a big pot of soup anyway. If for some reason I realize I won’t finish it all within a few days, I just freeze it. Soup freezes great and will defrost in no time. I’d rather make more than necessary to have ready to go than scramble on busier nights or opt to eat out more often than I can actually afford. While beef and barley is the classic soup combo, I had some ground sausage hanging out in the freezer and figured it would work just as well. If you have beef, certainly use that here, instead. I started the soup, as most soups start, by browning onions, carrots, garlic and herbs in olive oil. These are the aromatics. I added the sausage and broke it up with a wooden spoon, letting it cook until browned. Next, I added the barley, letting it sauté for a minute or two. I think barley is excellent in soup. It doesn’t turn mushy or puff up like how most other grains or pasta. Barley maintains a nice chewy texture and adds some heartiness. Try subbing it for other grains in your favorite soups or those soups needing something to make them more filling. Then in went the liquids – broth and crushed tomatoes. I used vegetable broth I already had opened, but beef broth would work too. I also found a couple of turnips hanging out in the fridge that I decided to add in as well. That’s what I love about soups. You really can add in a little of anything. It’s the perfect way to clean up those odds and ends you might have accumulated. After letting the soup simmer a good 30 minutes, I mixed in a few cups of spinach. It’ll cook down a ton, as I always seem surprised to find, so don’t worry if it seems like too much at first. Then, the soup just needed a few minutes more for the spinach to wilt. Before serving, I added a splash of lemon juice for brightness and salt and pepper as needed. Adding acidity like citrus or vinegar at the end of a soup will help bring out the flavors and add a level of freshness. In a large stockpot, heat the oil over medium high heat. When hot, add the garlic, onion, carrots and thyme. Season with salt and pepper. Cook, stirring occasionally until vegetables start to brown and become tender, about 7 minutes or so. Add in the ground sausage and break up with a wooden spoon. Let start to brown for about 5 minutes. Stir in the barley and let cook for a couple of minutes. Next, pour in the tomatoes, broth, and turnip. Bring to a boil and then lower heat to a simmer and cook about 30 minutes until the barley and turnips are tender. A couple minutes before serving, stir in the spinach. Let it wilt, then add the lemon juice. Taste and adjust seasoning. We’ve talked about cooking with grains in the past. If you don’t recall, here is a chart of how to cook 10 common grains for your reference. And cooking dried beans was another past topic in the post on RAFL’s Everyday Cehf titled A Beginner’s Guide to Dried Beans. What I love about this recipe is that everything is interchangeable. Use the grains, beans and type of greens that you like most or have on hand – it doesn’t matter. Serve it hot or cold, as a side or main dish, vegetarian or chock full of bacon. (If you go the bacon route try a maple smoked variety – adds some amazing flavor.) It’s all up to what you like and want to do. And in the end, you can even top it with your preferred dressing. If using bacon: Heat a skillet on medium heat and add chopped bacon. Fry until golden brown, then remove bacon with a slotted spoon and let drain on a paper towel, keeping the bacon drippings in the pan. If not using bacon: Melt the butter in a pan over medium heat. spinach and stir for 2-3 minutes, until spinach is wilted down. Add in beans and quinoa. Turn off heat and stir in bacon (if used). Serve as a main entree or side dish. Dress with your favorite dressing for extra flavor, if desired. Winter squash is versatile, delicious, and healthy – and it’s the December Vermont Harvest of the Month being featured through our Upper Valley Farm to School program and others across the state. This fruit makes a comforting soup, a sweet side, or a fabulous main dish. Stock up on local winter squash at your farmers’ market or farmstand and try these satisfying dishes. Cut squash in half lengthwise; discard seeds. Place squash cut side down in a greased or foil-lined baking pan. Bake, uncovered, at 400° for 40-50 minutes or until tender. When cool enough to handle, scoop out pulp; set aside. In a large saucepan, saute onion and garlic in oil until tender. Add the flour, salt, curry powder, and cayenne until blended. Stir in broth. Add bay leaf. Bring to a boil; cook and stir for 2 minutes or until thickened. Reduce heat; simmer, uncovered, for 20 minutes. Discard bay leaf. Cool to room temperature. In a blender, combine half of the broth mixture and squash; cover and process until smooth. Repeat with remaining broth mixture and squash. Return to the saucepan; heat through. Combine the topping ingredients; place a dollop on each serving. When we do cooking demos at our farm to workplace sites, attendees are always looking for quick, minimal effort recipes and methods. These are the 9-5 type of folks who have full schedules or families and need to get home and put something together for dinner in a relatively short amount of time. Although personally, I love to spend hours in my kitchen, I also love to show people that cooking good food doesn’t have to be difficult or take long. Yvonne Brunot prepared this recipe at a recent demo and I thought it was an ideal fit for our soup theme. First, it showed that soups don’t have to take hours, in fact, just half an hour can work fine. Similarly to the Green Lentil Soup with Curry Butter recipe, the extent of the active cooking here is just chopping an onion and mincing some garlic. What does that take – five minutes maybe? Easy. Then, the soup simmers for short period of time while you get other things done and you’ve got diner in no time. Heat olive oil in a large pot over medium-high heat. Add onion and garlic and saute until the onions begin to turn translucent; lower heat if browning starts to occur. Add spices and saute a minute or so. Add tomatoes, chickpeas and broth. Season with a couple pinches of salt and a few grinds of fresh pepper. Stir well. Chickpeas should be just covered with liquid. Add some water, if needed. Bring to a simmer, then lower heat to low and gently simmer for 25 minutes. Remove soup from heat. Use a potato masher or immersion blender to mash up some of the chickpeas right in the pot. 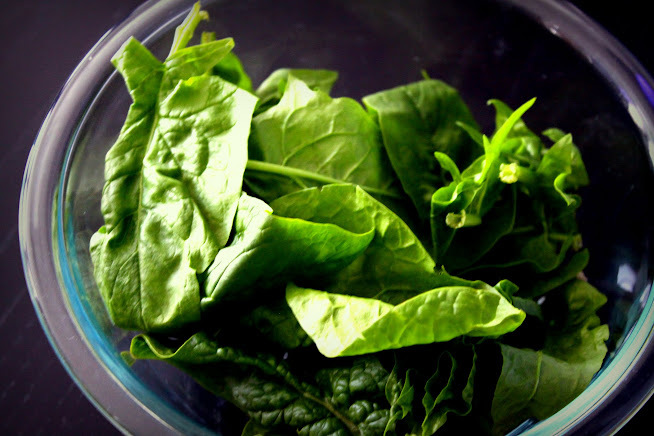 Stir in the spinach and let heat through until wilted, just a couple minutes. Season again, to taste, with salt and pepper. Serve. I don’t know about you, but I have this habit of really getting into a food or ingredient, stocking up on it, and then forgetting about it for awhile because I found something else, equally as awesome, to cook. I realized this the other day when I noticed I hadn’t touched my jar full of green lentils (they come in red and pink too!) in quite some time. Considering how quick they cook (20 – 30 minutes) compared to other beans, I didn’t even need to do any planning to get them on my plate (or bowl) for dinner. And this soup rocks. I know I’ve probably said that about all of the soups at this point – but I guarantee you won’t be able to get enough of this rich, sweet, nutty and just plain delicious lentil soup. I’m really growing to appreciate the combination of coconut milk and curry. Mix these two ingredients together, pour over anything and I’ll be happy. I used a sweet curry powder this time, but I’m confident any would work well. It’s all about experimenting too, right? Did you know that after soybeans and hemp, lentils have the highest amount of protein by weight? They also contain fiber, folate and Vitamin B. Not too shabby. Combine with a grain and you’ve got yourself a complete protein. So grab yourself some bread and dig in. Combine the butter, onion, garlic, and red pepper flakes in a large soup pot over medium heat, stirring regularly, until the onions soften, a couple minutes. Add the vegetable broth and lentils and simmer, covered, until the lentils are tender. This usually takes 20 to 30 minutes. When the lentils are finished cooking, remove from the heat, stir in the coconut milk and 1/4 teaspoon salt, and puree with an immersion blender. You can leave the soup a bit chunky if you like, or puree until it is perfectly smooth. Then add in the spinach. Stir in half of the spiced butter, taste, and add more salt, if needed, typically a couple of teaspoons if you used water instead of a salted broth. Serve drizzled with the remaining spice butter and sprinkled with chives, if using.